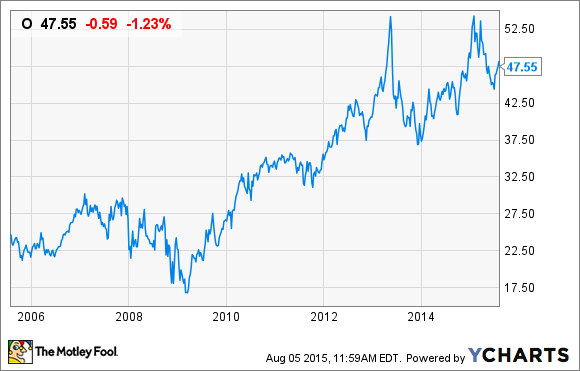 Is Now a Good Time to Buy Realty Income Corporation? REITs like Realty Income can be difficult to value. Here's what you need to know. Note: This is the final article of an eight-part series on Realty Income Corporation. Previous articles have discussed the company's history, business model, industry, income statement/balance sheet, management, growth opportunities, and risks. Realty Income Corporation (NYSE:O) is one of the most popular and highly regarded real estate investment trusts in the market and for good reason. Since going public in 1994, Realty Income has delivered market-beating returns and an income stream that has steadily risen. However, just because Realty Income is a great company doesn't mean that now is a good time to buy its stock. Here's what you need to know about assessing Realty Income's valuation and where it stands now. Before attempting to analyze the valuation of any REIT, you need to know what metrics to use. Some of the numbers typically useful in stock analysis are practically worthless when looking at REITs like Realty Income. Most notably, earnings per share (EPS) isn't a very effective metric to use. REITs are allowed to depreciate their real estate assets over a number of years, and this is counted against its earnings -- even though it's not an "expense" at all. As a result, REIT earnings (and P/E ratios, by association) look much worse than they actually are. During the second quarter, Realty Income reported an EPS of $0.25 per share, which implies a P/E ratio of about 48, which sounds ridiculously expensive. A better metric to use is Funds From Operations (FFO), which adds back in the depreciation "expense" and amortization expense, and subtracts any gains resulting from the sale of properties. Realty Income produced FFO of $0.69 per share for the second quarter, which, on an annualized basis, translates to a P/FFO of 17.4 -- a much more reasonable valuation multiple. FFO is generally considered to be the best way to assess a REIT's ongoing performance and ability to pay its dividends. Now that we know which metrics to use, let's take a look at how expensive Realty Income is. Since FFO is the best measure of a REIT's ongoing performance, we'll use that as our basis for comparison. So, Realty Income's current TTM price-to-FFO multiple of 18.2 is right around the company's five-year average. In other words, compared to its historical valuation, shares are neither cheap nor expensive. It's important to note that a quick glance at a chart may indicate that Realty Income shares have gotten significantly more expensive, but this is not the case. Even though Realty Income's share price has risen by about 50% over the past five years, it is actually less expensive than it was at the beginning of that time period. How does Realty Income's valuation compare to its peers? Realty Income's most direct competitor is National Retail Properties, which has a rather similar business model (focused on freestanding retail properties with the same type of tenants and relatively low debt). And, there are many retail REITs that specialize in other types of retail, such as shopping centers and malls. Let's take a look at how Realty Income compares. So, while Realty Income is slightly more "expensive" than its closest competitor, it also has a slightly stronger history of performance. Over the past 20 years, Realty Income has delivered average total returns of 16.4% per year, while National Retail has produced a 13% average. This is still a rather strong performance and would put a smile on the face of any long-term shareholder, but it could explain why investors think slightly more highly of Realty Income. Realty Income's "margin of safety"
Traditionally, a stock's margin of safety refers to the difference between its share price and its intrinsic value. However, determining the intrinsic value of a REIT is tough. A company's book value is a common way of figuring out how much its shares are worth, but this is a flawed approach when dealing with real estate. On Realty Income's balance sheet, it can only list the cost of its real estate holdings, not their current values. For example, if Realty Income purchased a property for $100,000 in 1995, and it's worth $500,000 today, it can only list the original $100,000 sale price as an asset. Not only that, but the accumulated depreciation of its properties is counted against the company's asset value. In other words, the balance sheet indicates that the value of real estate tends to go down over time, when in fact the exact opposite is often true. An ideal way to assess the intrinsic value of Realty Income would be to add up the current market value of its properties, but this is tricky. Not only are there several different ways of assigning a value to real estate, but they're more of an opinion than a fact. Having said that, let's give it a try. One way we can get a decent estimate of Realty Income's intrinsic value is to look at how much income its properties bring in, and compare that to the industry average cap rate (the cash flow properties produce divided by their cost). According to the latest cap rate survey by CBRE, the average cap rate for high-quality, "class A" retail properties is 5.97%. And, if we take Realty Income's second-quarter revenue of $253.9 million ($1.015 billion annualized) and divide by the expected cap rate -- which would give us a good estimate of what Realty Income could expect to sell its properties for -- we arrive at an overall valuation of just over $17 billion for Realty Income's property portfolio. Subtracting Realty Income's debt and preferred stock gives us a total intrinsic value of $11.3 billion. Finally, dividing by the current number of outstanding shares produces an intrinsic value per share of $48.08 -- about 1% more than the current share price. So, it would be fair to say that any price below $48.08 would give us some margin of safety with our investment. Of course, this isn't a perfect way of valuing an entire portfolio of properties, but it is a pretty good estimate. In a nutshell, Realty Income doesn't look particularly cheap right now, but it doesn't look too expensive, either. Theoretically, REITs should trade for the total value of their properties minus any debt, and it looks like Realty Income does just that. The stock trades right in the middle of its own historical average valuation, and it appears to be appropriately valued when compared with peers. Realty Income is a stock to buy for the long haul, and now looks to be a decent (but not ideal) time to get in. However, keep in mind our intrinsic value calculation, as any significant dips in the share price could signal an opportunity to get in on this long-term winner at a discount.